Note: This graphic extracts the best qualities and functions of Dynamics 365 & Dynamics AX, but does not document them all. For more specifics, visit the modules section of this page. Why Clients Choose Dynamics 365 or AX On-Premise? Key elements to success in today’s business world are the company’s software and its ability to process business intelligence. Microsoft Dynamics AX On-Premise, based on a powerful and flexible platform built by Microsoft, enables you to achieve visibility, insight and control over your operations. And most importantly, it’s designed to work the way your people already work—with Microsoft business apps and IT infrastructure—so you’ll see faster adoption and broader usage. Other solutions offer enterprise integration, but fall short as they don’t integrate with other software. 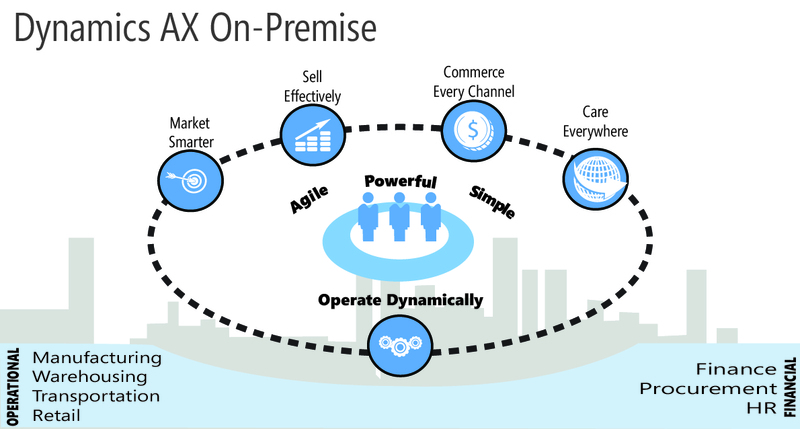 Dynamics AX is one unified integrative ERP solution. Dynamics AX On-Premise is composed of several modules, which can be thought of as functional compartments. These modules represent areas such as financials, human resources, project accounting and production, to name just a few. As the software is feature rich with a lower total cost of ownership; your company is getting Tier 1 software at a Tier 2 price. The core ERP capabilities or modules support your users with the role based information they need. 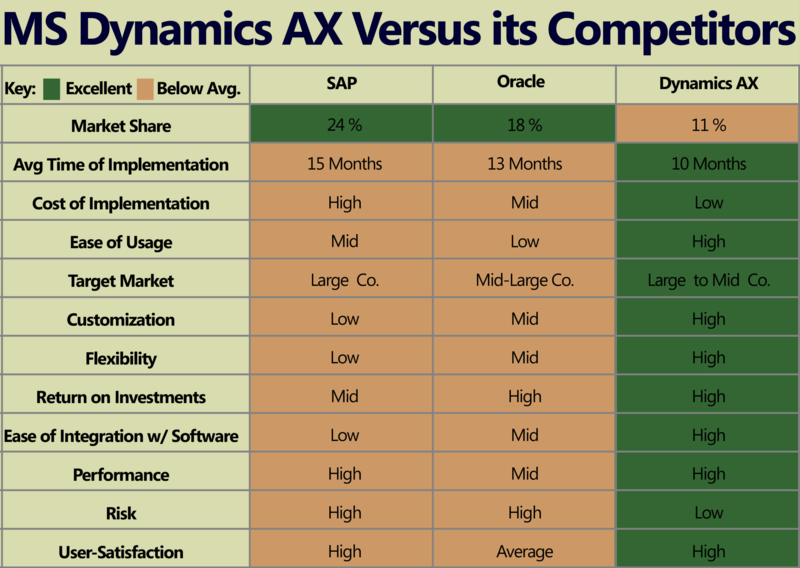 Think of Dynamics AX as an all inclusive tool-kit. It has many parts, but is not complicated to use. Use what you need after implementation, and if your business obligations demand more functionality, Dynamics AX can help with that in the future too. View the 14 most used modules and their description below to realize there really is no better ERP package that scales for growth than Dynamics AX. Create boardroom-quality reports without IT assistance, consolidate across both Microsoft Dynamics ERP and other general ledgers, and take advantage of secure report distribution and storage through the centralized Report Library. Drive actionable insights to people across the enterprise using easy-to-use online analytical processing (OLAP) and data-mining capabilities. Microsoft Dynamics AX 2012 provides preconfigured data cubes for key business areas. Employees can easily access the data from KPIs in their Role Center or directly from Microsoft Excel. Give employees instant access to information with built-in reports using Microsoft SQL Server Reporting Services. Automatically generate custom reports with Microsoft SQL Server Report Builder, an ad hoc query tool. Access a wide variety of standard reports (more than 800) including analytical reports. Accountant, accounting manager, accounts payable coordinator, accounts receiveable administrator, bookkeeper, CEO, CFO, controller, treasurer, budget manager, environmemtal manager, credit, collections manager, and create your own (CYO) role center. Track invoices, terms, and discounts. Process customer prepayments. Receive and enter customer payments. Monitor credit checks and manage collections with integration to case management to centralize and monitor all activities per case. Supports multiple currencies, as well as country-specific capabilities to help organizations meet local and regional financial regulations (such as value-added tax (VAT) requirements) and market requirements (such as electronic banking). Get insight into your business by tagging transactions using unlimited financial dimensions. Dimensions are used across the various modules in Microsoft Dynamics AX, and can be used for tracking profit, cost centers, departments, value streams, product lines, or any other reporting units. The ability to update the general ledger online provides fast and accurate financial reporting. Manage the full accounting life cycle of assets from acquisition to depreciation, and transfer/disposition. Financial accounting record management with ability to configure multiple and recurring journals, allocation of cost and income, and support creation of closing transactions, including preparation of preclosing documents and closing books. Gain insight using unlimited financial dimensions and advanced account structures and rules. Human resource manager, training manager, and create your own. Establish, communicate, and monitor absence policies. Administer organizational structures, including formal and informal hierarchies and position management. Design, schedule, and use questionnaires that can be used across functional domains and legal entities. The capabilities also include the communication capabilities with target audiences within and outside the organization. Questionnaires can be published on the web. Administer recruitment processes including campaigns, screening, developments, and candidate correspondence. Sites Services extend the recruitment process with a cloud-based service facilitating the job posting process to and application of external candidates. Analyze skills (gaps) based on job profiles and search for skills (including filtering and weighting of skills). Track profile-based, clock-in/clock-out registrations for workers and generate pay information to payroll system. Set up, deliver, and analyze training courses. Manage expenses with integrated workflow. Submit a travel requisition including projected cost of travel for approval. Define expense policies and automate the reimbursement of travel expenses. Gain insight into expense behavior with the expense management cube. Purchasing agent, purchasing manager, employee, shipping and receiving, order processor, and CYO. Provides category managers the ability to define different category hierarchies that are independent of, but still related to, commodity codes or catalog/item hierarchies in order to easily manage the overall spending based on categories. Manage the entire life cycle of procurement from planned purchase order to confirming and changing a purchase order. This cycle also includes returned orders. This module also supports direct deliveries, pro-forma purchase orders, and landedcost charges to purchase orders such as freight, insurance, and unrecoverable taxes. Manage purchase requisitions of indirect goods and services using a catalog-based or non-catalog-based procurement process. The procurement process is supported by an approval workflow using the organizational hierarchy. A Microsoft SharePoint®–based catalog can easily be created from products defined in product information management. The catalog also supports punch-out capabilities to external vendor sites. Sophisticated budget check is included. Gain insight into the organization’s procurement performance using transactional reports, analytical reports (such as vendor and procurement spend analysis, top 100 vendors, vendor performance), and KPIs. A predefined data cube for purchasing is included. Procurement operations can be driven and governed by workflows. With the flexible and visual workflow engine, procurement managers are able to set up workflows that make the procurement cycle more efficient and enforce purchasing policy compliance. Enforce purchasing policies with a collection of purchasing policy rules that control the procurement process. A centralized procurement desk defines policy rules to support global policies and processes, and applies them to purchase requisitions and purchase orders based on the legal buying entity and operating unit. For procurement and sourcing there are six policy rules: catalog, catalog access, category, purchase requisition RFQ, purchase requisition control, and purchase order creation and demand consolidation. In addition to policy rules, Microsoft Dynamics AX 2012 provides expenditure reviewers and signing limits. Manage the RFQ process including vendor reply, comparison, and selection. Replies can be entered by the vendor in the vendor portal. Take advantage of Sites Services* to extend the procurement process with a cloud-based service facilitating the RFQ process. A Task Guide is an end-user focused experience that allows the user to follow a guided step-by-step set of how-to instructions to complete a business scenario that is contained in a Task recording. The user is instructed to complete each step by way of a pop-up prompt. Vendor management includes vendor search, vendor maintenance, and support for requesting and approving a new vendor via the Enterprise Portal supported by workflow. Take advantage of Sites Services* to extend the vendor onboarding process with a cloud-based service facilitating the dialog with new vendors. Enable vendors to update profile data, upload catalog content, and review invoices and payments. Vendors can receive notifications from the organization, respond to RFQs, and view vendor performance. Operations manager, production manager, and CYO. Define multiple inventory dimensions, including dual units of measure, catch-weight calculations, packaging codes, variations to the main item, and lots. Model manufacturing and logistics processes as production flows. Use kanbans and kanban boards to signal demand requirements. Optimize production and materials planning, forecasting, and scheduling. Simultaneously schedule materials and capacity. Calculate available-to-promise (ATP) and capable-to-promise (CTP) deliveries. Plan and execute routing and operations. Use finite or infinite planning. Configure custom products with a unique bill of materials and routing by using the product configurator. The product configuration models are based on constraints, and can be used from sales order, sales quotation, purchase order, and production order. Create a bill of materials for production including phantoms using a graphical BOM designer. Modify and track individual line items. Manage multilevel formulas or recipes, coproducts, and byproducts. Use version control to release the right BOM. The process can even be simplified with an ISV product called CADLink. Understand work in progress (WIP) and actual cost through production tracking and reporting. Track detailed resource and throughput costs, including work center costs. Report production variances to standard costs. Create, schedule, view, track, split, roll back, or categorize production orders to maximize efficiency. Create production orders from sales orders. Follow production through creation, estimation, schedule, release, started, finished, and costed. Use scrap on BOM, resource, and route. Gain insight with predefined KPIs in the SQL Server analysis data cube for production. Use finite or infinite scheduling, forward and backward from various dates. Quickly (re)schedule jobs and simulate alternatives by dragging Gantt chart items. Resolve scheduling overloads by reassigning operations to alternate work centers. Optimize scheduling across the organization with a unified resource model and scheduling engine. Improve machine utilization by combining similar products while letting customers request multiple quality specifications per product. Manage and track shop floor operations. Register products and resources and items for operations and jobs including a touch-enabled data entry. Project manager, project team member, and CYO. Manage project and grant funding by associating multiple funding sources with a project or grant, optionally linking any transaction to a specific funding source, prioritizing funding sources, and restricting funding sources to exclusive activities or classes of expenditures. Projects can be integrated with the scheduling and resource management capabilities of Microsoft Project Server 2010 to streamline project management for any size of project. Take advantage of bidirectional interoperability with Microsoft Project for projects, activities, tasks, and resource allocation. Enter and itemize project costs, employee hours, materials used, and fees incurred. Streamline billing of projects by creating and editing invoice proposals for hours, expenses, items, sales orders, fees, subscriptions, advance and deduction payments, or milestones. Split billing enables shared project costs between multiple customers or internal organizations. Retention terms can be specified on customer invoices and vendor payments. Approval workflow ensures accurate project invoices before they are sent to the customer. Schedule payments to project vendors when you receive payments from customers (pay when paid). Retain part of payment to a vendor. Funding limits enforce contractual caps on project costs. Manage projects with forecast (hour, expense, item, fee, on-account) and budgets. Project budgets are workflow-enabled for approval of original budgets and revisions. Maintain project cost control by summarizing actual cost, committed cost, and remaining budget to discover total expected cost, and compare with the original budget. Measure utilization rates by comparing actual hours to budgeted hours. Compare the status of invoiced and chargeable transactions of a project or contract with the project quotation. Plan, create, manage, control, and complete projects for your organization including time and materials, fixed price, and internal projects like investment, cost, and time projects. Create a project hierarchy comprising multiple subprojects. Easily plan projects, large or small, by matching work requirements with available resources. Work breakdown structure (see below) templates make it easy to quickly plan common types of projects. Task requirements (skills, education, experience) help find the right resource for the job. Work breakdown templates enable you to quickly build accurate project quotations. And project quotation profitability helps you select the right opportunities to pursue. Gain project visibility with quotation approval workflows. Capture project time and expense quickly and accurately. Enter timesheets through project time management or Enterprise Portal. Time-entry is supported by an approval process. Charge travel-related expenses against specific projects with expense management. Full integration with expense management enables expenses to be distributed to a single project or across multiple projects. Recognize actual costs to avoid potential cost overruns. Post and accrue revenue for fixed price based on completion percentage or completed contract. Accrue revenue or capitalize costs for time-and-material projects to recognize gross margin. Handle WIP for investment projects during the project before final elimination of the WIP value to a fixed asset upon completion. Marketing executive, sales manager, super sales rep, dedicated sales rep, account manager, marketing manager, and marketing staffer. Manage agreements based on monetary or volume commitments. Organizations are able to set up agreements with specific terms and conditions and monitor the status. Develop, conduct, follow up on, and analyze marketing campaigns for any defined group of customers and prospects. Manage leads and opportunities including the ability to create, review, update, and manage information about leads. Associate employees, responsibilities, and campaign data with stored information. Set, monitor, and manage sales performance of sales personnel, sales units, and sales companies. Share sales information between Microsoft Dynamics AX and Microsoft Dynamics CRM both online and on-premises. Efficiently open, assign, resolve, and follow up on customer issues from a single form. Sites Services* extend the case management process with a cloud-based service, facilitating the dialog with customers. Gain insight in sales and marketing performance with predefined KPIs in the sales and customer relationship management (CRM) cubes. Use case management and questionnaires to improve your customer service delivery. Analyze expenses and profit and loss associated with the service engagement. Register repair tasks, track diagnosis, and record resolution. Identify faulty products. Tailor agreements to a wide range of customer requirements, service prices, and payment arrangements. Work with flexible templates and quickly create detailed, multilevel agreements, and define tasks and frequency for service calls. Create service tasks and appointments within the Microsoft Outlook® messaging and collaboration client. A service order represents a visit of a service technician to a customer site. Set up orders manually or automatically at periodic intervals. Record service time, expenses, and items. Rapidly create service orders over the Internet with Enterprise Portal in Microsoft Dynamics AX. Create and process service subscriptions for fixed-price service over a period of time. Accommodate revenue based on fixed or irregular periods and multiple price arrangements. Purchasing agent, purchasing manager, shipping and receiving, order processor. Enter and edit sales and purchase forecasts. Use specific keys to allocate forecast to individual items and time periods. Automate trade between subsidiaries or distribution centers. Sales and purchase orders can be generated manually or automatically across your subsidiaries. Track items by inventory dimensions including site, warehouse, pallet, location, batch, and serial number. Take advantage of multiple inventory control systems and inventory valuation methods including first in/first out (FIFO), last in/first out (LIFO), standard cost, moving, and weighted average. Reduce inventory costs and eliminate waste by using the ABC-analysis and by pulling inventory in optimal sequence using “best-before” management and first expired/first out (FEFO) or first in/first out (FIFO) picking guidance. Centralize management of products and services across the organization including BOM and process formulas (see Product Information Management). Improve business processes for quality assurance, quality control, and lot traceability. Manage the test process. Set aside items in quarantine using quarantine orders. Manage the return order process. Control who can return items, and which items can be returned. Categorize returns according to reason code or method of disposition. Automatically transfer information received from shipping carriers (Fedex, UPS, and Kewill), including freight charges and tracking numbers, to Microsoft Dynamics AX. manage your company’s transportation, and identify vendor and routing solutions for inbound and outbound orders. For example, you can identify the fastest route or the least expensive rate for a shipment. A scheduled route is a predefined route with predefined hubs (that being vendors, customers or warehouses) you execute regularly on a given schedule. Calculates Inbound/Outbound Shipments and Multi-Shipment Loads. Can calculate shipment consolidation and load building. Schedules appointments. Tracks Driver Check-in/check out history as well as driver log management. Shops Rates based on set criteria. Improve your customer service level with real-time visibility into inventory using the inventory dimensions including license plates. Account for inventory with multiple cycle counting strategies including threshold cycle counting for picking, cycle counting plans, zero quantity on hand cycle counting, and ad-hoc cycle counting using filtering. Use flexible location directives to organize your warehouse layout and zones. Efficiently put away inbound goods with advanced put away strategies. Increase flexibility by configuring simple workflows without coding for put-away and picking activities. Use filter capabilities to determine the custom workflow. Replenish inventory based on picking, min/max, and transportation load based replenishment. Support material handling within the warehouse with browser-based mobile handheld RF-devices. Create mobile handheld device menus from within Microsoft Dynamics AX including creation of new menus for each user or user groups, change layout and colors, and error log and actions. Give warehouse workers scanning precision and enhanced performance in picking and put away processes. Define policy rules in functional modules to help guide the flow of business. The policy framework can be used to define policies including signing limits, expense reports, purchase requisitions, audit control of documents, and payment of vendor invoices. Attach documents to records throughout the application using the document management system. It handles several types of documents, including letters, worksheets, and simple notes. Inventory and tracking dimensions: Track physical and financial transactions using inventory dimensions including site, warehouse, location, pallet, batch, and serial number. Plan resources based on production activities and capabilities of resources. Types of resources can be tool, machine, vendor, location, and human resource. Define flexible, multidimensional tax setup to comply with the various tax regulations in multiple countries. Use tax codes, tax groups, and item tax groups to configure taxes. The emphasis of the tax module is on sales taxes, but it could also be used to configure other duties and taxes, including country-specific tax reporting, packaging duties, EU reverse charge tax, and United States use tax. People and organizations have the option of presenting the Microsoft Dynamics AX user interface, online help, forms, reports, and menus in any of the available languages. Languages can also be used in printed reports, invoices, purchase and sales orders, and other business documents, and by remote users in the Enterprise Portal interface. Find an overview of the available languages here. Take advantage of other reference data such as unit of measure, category, and (fiscal) calendar. Support multiple time zones, which can be set at user level. Share information on all organizations and people—internal and external—that the organization is engaged with through a common repository. The information in the global address book is abstracted in the form of a party. Roles associated with a party include customers, prospects, vendors, employees, competitors, contacts, and workers. Model your organizational structures to accurately reflect your organization. Set up multiple organizational hierarchies to view and report on your business from different perspectives. You can define the following types of internal organizations: legal entities, operating units, and teams. View and edit the organizational hierarchy using a graphical representation. Centralize management of products and services (non-stock items) across the organization, including bills of materials (discrete manufacturing), formulas (process manufacturing), and variant and configurable products. Describe items using up to four item dimensions: configuration, size, style, and color. Manage the release of products and services to individual legal entities. How Is Dynamics 365 & Dynamics AX On-Premise Sold & Implemented? Microsoft Dynamics AX is sold through Value Added Resellers, commonly referred to as Dynamics AX Partners. Partners will issue and help you implement your license of Dynamics AX. Additional modules, users and add-ons for Dynamics AX can also be licensed through your partner. At Clients First Business Solutions, we know that there is no such thing as “universal” ERP solutions. Dynamics AX can be implemented without customization, but to be better effective at your company, Dynamics AX can be tailored to your company’s needs, organizational culture, staff capabilities, and project’s characteristics. We recommend consulting a Dynamics AX partner such as Clients First who has experience working with the product since its inception. This ensures adequate experience in deploying the system in environments. Call 800.331.8382 for any questions regarding Dynamics AX or Dynamics 365. 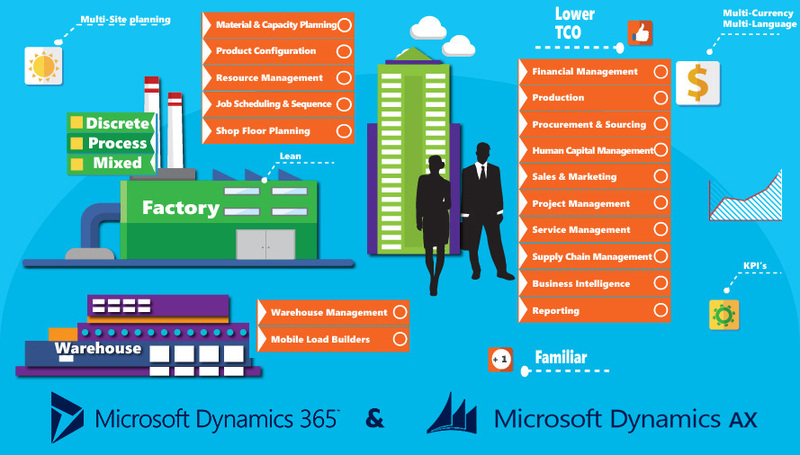 How does Dynamics 365 & Dynamics AX On-Premise stack up against other ERP software? Still Have More Questions about Dynamics 365 & Dynamics AX On-Premise? 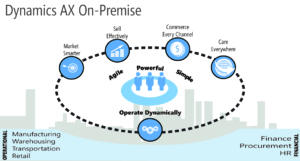 Microsoft Dynamics AX On-Premise POWERFUL. AGILE. SIMPLE. Dynamics AX Life Cycle Policies – How Long is My Version Supported? 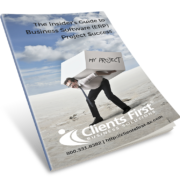 Download the Insiders Guide to ERP Success!